On September 22 at approximately 4:30 a.m., the Combined Anti-Drug Task Force (C.A.T. Team) Cpl. Chad Booth conducted a stop on a tow truck near mile marker 23 in Sulphur traveling eastbound on I-10 for a traffic violation. When Cpl. 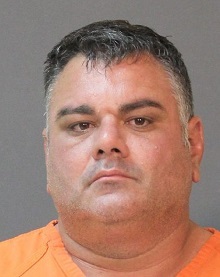 Booth was talking with the driver of the truck, Elton J. Richard, 42, Church Point, LA, he began to act suspiciously. Cpl. Booth asked for permission to search the truck but Richard refused. He then deployed his trained and certified drug detection K-9 “Sam” to conduct a free air sniff around the truck and Sam provided a positive response to the odor of a controlled substance coming from the vehicle. 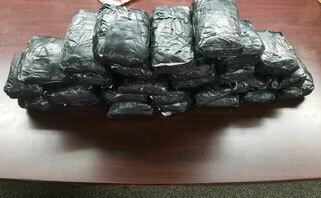 A search was conducted and 27 bundles, totaling approximately 63 pounds, of powder cocaine, with an estimated street value of $870,000, was recovered from inside the truck. Richard was arrested and booked into the Calcasieu Correctional Center and charged with possession of CDS II (cocaine) over 28 grams. Judge Clayton Davis set his bond at $250,000.